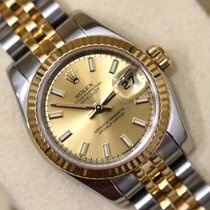 When the original Datejust was introduced into the Rolex family back in 1945, it became the first wristwatch to exhibit the day of the month through an aperture in the dial. 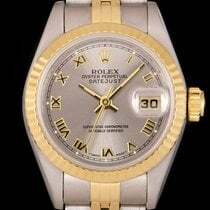 Then years later, when a magnifying glass was added to provide the wearer with a clearer view of the date, it quickly became a Rolex trademark and industry standard. 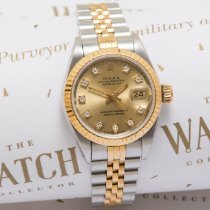 The 1970s saw the Datejust go through a series of changes, and as a result the Datejust, and the Rolex Lady Datejust itself was given a series of facets. The Lady Datejust belongs to a family tree of Datejust watches that were the first pressure-proof and self-winding wristwatches in the world. To sit elegantly on a woman’s wrist, the Rolex Oyster Perpetual Lady Datejust is enclosed in a 26mm case, 5mm smaller in radius than the original Datejust model. The watch is complemented by a variety of bezels to choose from and is constructed in an array of materials – 18K yellow, white or Eve rosé gold, as well as 904L stainless steel or 905 platinum. The Rolex Lady Datejust is also represented through a host of dials with beautiful colors and decorations, each possessing its own character. The dial of this timeless watch holds a truly diverse beauty. A variety of patterns and colors were designed for the Rolex Lady Datejust, such as; champagne, pink or rhodium floral motifs. For a statelier look, the Lady Datejust can be lined with diamonds. Enclosed in its prestigious case is a world of masterful craftsmanship. The Lady Datejust bares a self-winding 2235 movement, a mechanism developed and manufactured exclusively by Rolex. The device ensures that the Lady Datejust does not require batteries and does not need winding, as it harnesses the energy required simply by being on the wearer’s wrist. The original Rolex Oyster water-proof watch was the first water-proof wristwatch in the world. 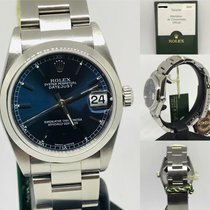 It was so successful that Rolex created a range of watches that they introduced into the now world famous Oyster Range with the Rolex Oyster Perpetual Lady Datejust being one. Like all Oysters the Rolex Lady Datejust is waterproof to 100m. 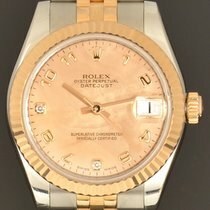 Rolex watches are widely regarded to be unparalleled in craftsmanship. 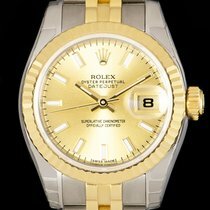 However, another element of Rolex’s success and esteem is the diversity their timepieces boast. 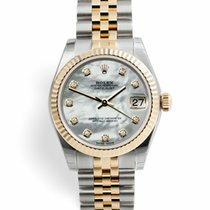 The Rolex Lady Datejust is suitable for almost any occasion, due to its diverse nature. The quality of the watch will also allow the watch to be worn daily, for decades to come.